Carol Ann Tomlinson began her career in education in the public school system, where she spent 21 years as a classroom teacher and in administrative roles. During that time, she taught high school, preschool, and middle school students in the content areas of English and language arts, history, and German. She also served as director of programs for advanced and struggling learners and as school community relations coordinator. While a teacher in the Fauquier County (Virginia) Public Schools, she received recognition as Outstanding Teacher at Warrenton Junior High School, Jaycees Outstanding Young Educator, American Legion Outstanding Educator, and Soroptimist Distinguished Women in Education. She was named Virginia's Teacher of the Year in 1974. Carol is currently the William Clay Parrish Jr. Professor and Chair of Educational Leadership, Foundations, and Policy at the University of Virginia's Curry School of Education, where she is also co-director of the University's Institutes on Academic Diversity. She works with both graduate and undergraduate students, particularly in the areas of curriculum and differentiated instruction. She was named Outstanding Professor at Curry in 2004 and received an All-University Teaching Award in 2008. In 2015, Carol was named number 16 of the 200 higher education faculty members in the United States deemed most influential in terms of shaping dialogue about education by the Education Week Edu-Scholar Public Influence Rankings. 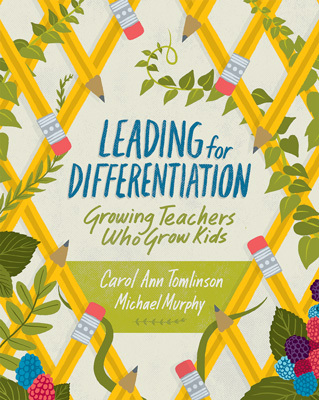 Carol is author of more than 250 books, book chapters, articles, and other educational materials including (for ASCD): How to Differentiate Instruction in Mixed-Ability Classrooms; The Differentiated Classroom: Responding to the Needs of All Learners (2nd edition); Fulfilling the Promise of the Differentiated Classroom: Strategies and Tools for Responsive Teaching; Integrating Differentiated Instruction and Understanding by Design: Connecting Content and Kids (with Jay McTighe); The Differentiated School: Making Revolutionary Changes in Teaching and Learning (with Kay Brimijoin and Lane Narvaez); and Leading and Managing a Differentiated Classroom (with Marcia Imbeau). Her ASCD books have been translated into 13 languages. Carol works regularly throughout the United States and internationally with educators who seek to create classrooms that are more effective for academically diverse student populations. She can be reached at Curry School of Education, P.O. Box 400277, Charlottesville, VA 22904 or by e-mail at cat3y@virginia.edu or www.differentiationcentral.com. Michael Murphy is a national educational coach, facilitator, and consultant currently living in Dallas, Texas. He draws from 39 years of educational experience in urban, suburban, and rural school district settings as he trains and works with teachers, teacher leaders, school leaders, and district leaders across North America. Much of Mike's work supports school and district leaders in planning and implementing large-scale improvement initiatives, visioning, understanding change and its effect on people, evaluating school improvement progress, designing exceptional professional development, and engaging people in productive, relationship-rich, results-based conversations. Since 2009, he has consulted with school leaders in 17 U.S. states and two Canadian provinces, and he has presented in numerous state, national, and international symposia and conferences. Mike's personal public school experiences include his work as teacher, elementary specialist, assistant principal, principal, director of planning and evaluation, special assistant to the superintendent, assistant superintendent, and acting superintendent, all in Texas. He holds a bachelor of fine arts degree and a master's degree in elementary education from Texas Tech University and a doctorate in curriculum and instruction from the University of North Texas. He has published numerous articles for national journals and is a contributing author or lead author for four educational books. Mike has been a long-time guest presenter at the University of Virginia's Summer Institute on Academic Diversity; has trained several thousand principals, assistant principals, and central office staff during his relationship with the Tennessee Academy for School Leaders; and is the former director of programs for the National Staff Development Council (now Learning Forward). He can be reached at 1309 Melrose Drive, Richardson, TX 75080, or via e-mail at mmurphy170@gmail.com.